Nantes’ Brazilian defender Diego Carlos (L) receives a red card from French referee Tony Chapron during the French L1 football match between Nantes and Paris Saint-Germain (Paris-SG) at the La Beaujoire stadium in Nantes, western France, on January 14, 2018. 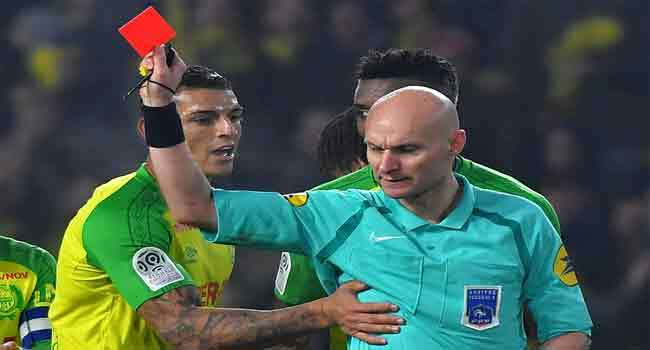 The referee who kicked a player during a French Ligue 1 game and then sent him off has been suspended “until further notice”, the French Football Federation (FFF) said on Monday. Tony Chapron kicked Diego Carlos of Nantes towards the end of Sunday’s game against Paris Saint-Germain after being knocked over when the pair collided in a bizarre incident. Chapron then showed the player a second yellow card. The FFF’s technical committee of referees said Chapron had been “withdrawn… until further notice” and would be called to appear before the French league’s disciplinary commission. The sanction means he has been taken off refereeing duties for Wednesday’s Ligue 1 game between Angers and Troyes. Footage of the incident quickly went viral across the world. Chapron and Diego Carlos were racing to catch up with a breakaway by PSG’s Kylian Mbappe as the game, which the visitors won 1-0, moved into stoppage time at the Stade de la Beaujoire. The referee appeared to cut across the Brazilian defender, sending both to the floor. As he got up, Chapron kicked the player, catching him on his right foot. He then started to walk away before turning around and brandishing a second yellow card. He also awarded PSG a free-kick. “He told me that he had never wanted to kick the player and that he had felt himself pushed in the back,” said Nantes president Waldemar Kita after talking to Chapron. “It’s a joke. I got 20 text messages from across the world telling me this referee is a joke,” Kita told French TV. Nantes midfielder Valentin Rongier had a good view of the incident and called for the referee to be given a lengthy ban. “He says he slipped, but I know he kicked him,” Rongier told Canal+. Ex-Real Madrid goalkeeper Iker Casillas was among those to express their bemusement on Twitter, joking that the referee should have got a red card himself. “Surely the good man will have apologised. It was spontaneous,” wrote Casillas.